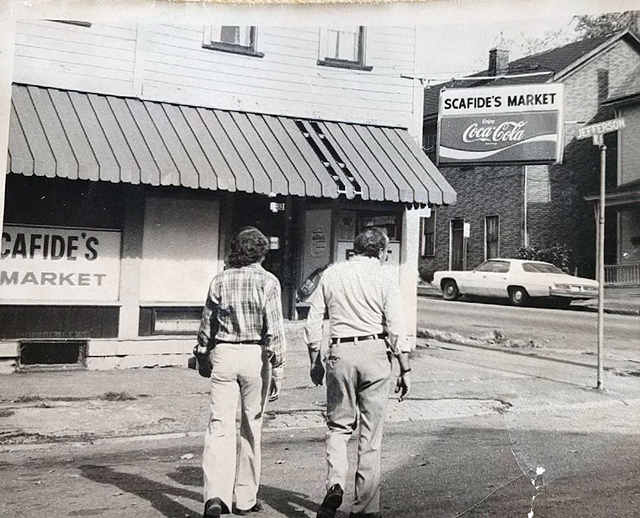 Scafide's Market as it appeared during its heyday as a market. Picture courtesy of Jim Scafide. Scafide's Market and part of Jefferson Street. The former Scafide's Market as it appears on Jefferson Street. This completes the north side of the street of the 300 block of W. 4th St.
South Side of the 300 Block of West 4th street from the 1923 Sanborn Fire Insurance map. Monroe Street is on the right and Jefferson Street is on the left. Standing At the South West corner of Monroe Street and W. 4th St. looking eastward. Possibly the closest East Liverpool comes to a southern style plantation house. The street address here is 346 W. 4th St. This picture and a three pictures after this one are all viewpoints to the same house. It is quite a stately house. Depicting 344 W. 4th St. Depicting 342 W. 4th St. Here we have 342 and 338 W. 4th St. Continuing eastward we have here 342, 338, 336 W. and 328 4th St.
Left of center you see a house. That house would be 324 W. 4th St.. That house does not appear on the 1903 or 1923 Sanborn fire insurance maps. It was built after either of those two time periods. Standing in the center of W. 4th St. just a little east of Persimmons Alley looking West towards the Newell bridge.